A huge thank you to England Lionesses and Olympique Lyonnais Féminin star Lucy Bronze, who kindly donated two signed shirts for auction to raise funds for Team Kenya! The items sold for just under £800, which will have a fantastic impact on Team Kenya’s work in Ndhiwa, western Kenya. 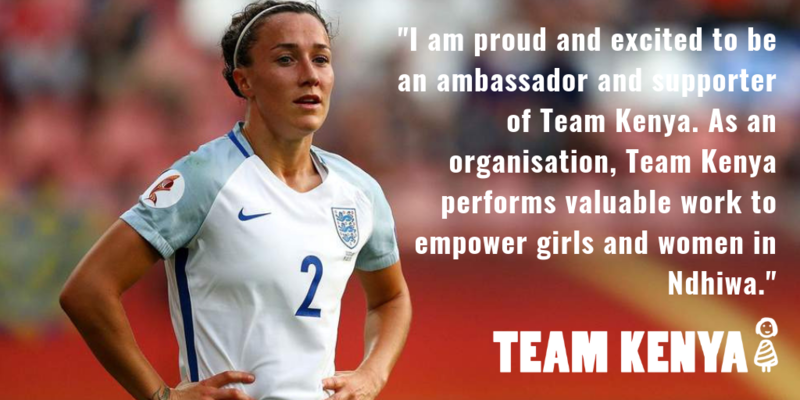 Why is Lucy Bronze an Ambassador for Team Kenya? Team Kenya involves entire communities in Ndhiwa, Western Kenya in gender equality, so that girls and women in rural Kenya can create their own bright futures. We work with local primary schools, and the whole community that surrounds them to tackle the barriers that prevent girls from accessing quality education. How does Team Kenya use Football? In Ndhiwa, violence towards girls is common, with more than 6 in 10 girls experiencing violent or sexual threats in school. To overcome this culture of violence towards girls, Team Kenya uses mixed gender football to to sensitise children and young people on issues around violence against women and girls, challenge attitudes and behavior in the wider community, and identify girls that are in need of support. Both boys and girls in partner primary schools gain football skills and opportunities to play and compete in mixed groups which emphasises the values of team membership, builds confidence and leadership skills, and demonstrates that girls and boys have equal potential. The programme consists of workshops that help girls to understand that they have the right to an education, the right to good health and the right to say no to inappropriate behaviour by boys and men. Boys are challenged to reconsider attitudes to girls and to accept that girls are equal to them in every way, and that they should be respected and are deserving of equal opportunities. How can I get involved with Team Kenya? Team Kenya is a small organisation. As a result, your support could make a huge difference to us! We are always in need of skilled volunteers to assist with our work in the UK and in Kenya, we rely heavily on people taking part in fundraising events on our behalf and we welcome any donations. If you would like to keep up to date with what we’re doing, please join our mailing list by giving your details below.